A collection of small drawings, done with ink on paper. 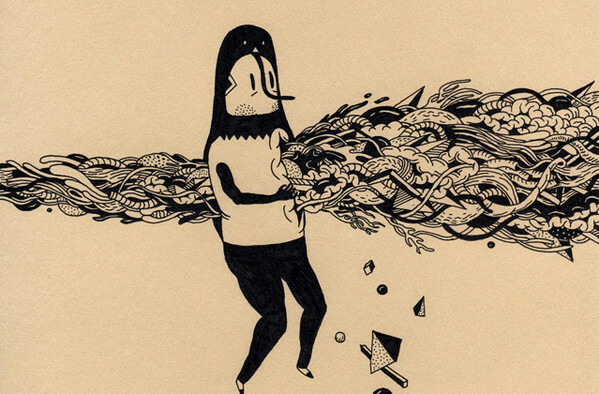 Saddo studied graphic arts at the University of Art and Design in Cluj-Napoca. After university, he founded one of the first street art collectives in Romania, The Playground. Saddo said that his discovery of street art is an important step to what he is today as an artist. It also paved the way to diverse commissions and collaborations with galleries in Bucharest, Vienna, Berlin, Copenhagen. Stockholm, New York, Los Angeles, Montreal, Glasgow, Salvador, and many more. As a young child, he used to devour horror and Sci-Fi movies and books that is then evident on the artistic imagery of his illustrations. Saddo’s work range is influenced by old masters of 15th – 17th century, Giuseppe Arcimboldo, Bosch, Brueghel, Walton Ford, naturalistic illustration, pop surrealism, religion, and mythology. Featured below are his dark, monochromatic and powerful drawings from Linework. Check out more of Saddo’s fantastic art on his portfolio. You can also follow him at Behance, Flickr or Facebook.